Necrodynamic is the 4th release of the German death / thrash metal quintet. Founded in 1995 the band created their own sound during their career, musically death metal with thrash elements and catchy melodies. The melody lines are more typical for power metal acts and the clear vocals as well, but sometimes singer Björn Gooßes sings with a deeper voice which reminds of their more death metal like in their beginning. At the moment the band is some­where between the death metal and power metal genre, interesting for open-minded fans of both genres. The song Blackelectric probably shows best what to expect from the album, coz it includes all elements and is a heavy rocking song which soon will be a highlight of their live shows! The powerful production of Harris Johns gives the album the special kick... Tombtrippin' is also a typical song for Night In Gales in 2001! 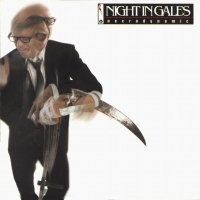 Is this the year of Night In Gales? If they get the chance to present the new material live, they might convince a lot people.... So, give them a chance to convince you! 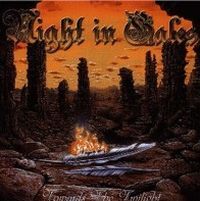 When I trust the cover artwork then Night In Gales is an ambitious death metal and the music proofs it. They are playing death metal, songs like Razor, Slavesun and Autumn Water are classic death metal. Technically the guys are very good and know how to melt variety, catchiness and harmonies. If singer Björn Gooßes would use his voice more variable, they would sound more unique.